Find out how to build a Salesforce REST API integration. While they have one of the most tuned and well-known sales approaches in software, there is almost a feeling that when a company gets to a certain size, they just decide it’s time to use Salesforce. It’s due to this that if you have a product that operates in the Sales and Marketing space, there is a huge opportunity in tapping into the Salesforce community and ecosystem. For example, we’ve built the GoSquared Salesforce integration to capture the on-site behavior of leads when they’re browsing your website (E.g. when a lead views your pricing page or watches a webinar), and send this directly into Salesforce ready for your sales team to act on within their existing workflow. They have an incredible developer community, including their own StackOverflow-esque forums. If you hit a roadblock, it’s likely someone has hit it before you, and you can find a documented solution. Similarly, they have an extremely robust e-learning platform with tracks that you can complete across a plethora of different subjects to get up to speed on a lot of their terminology and principals. There can, however, be an abundance of content to sift through and it can be an incredibly time-consuming process — particularly if building and developing on the Salesforce Platform is not going to be the core responsibility of your job! This post is really focused on communicating — at a very basic level — the key concepts needed to build a basic Salesforce REST API integration. Listing an app within the Salesforce AppExchange will give you the ability to build your product directly into the Salesforce platform. For example, visualizing your product’s data directly within a component in Salesforce. While there are clear benefits in having a presence within this ecosystem it’s important to note that there are some costs associated with doing so. Allow a user of our application to authorize us to access and transfer their Salesforce data on their behalf. The Salesforce developer accounts are awesome and pretty much give you a working Salesforce organization (an organization is Salesforce’s terminology for an account) so you can get a feel for the interface and even add and manage users. Once you have your developer account set up, you’ll want to set up a Connected App. Connected Apps have the ability to offer a lot of functionality, and sometimes that can make it a bit difficult to get your head around them. This will be the URL that Salesforce POSTs to when the user has authorized your app to access their data. This will include the access and request token (we’ll explain a bit more on this below but they are essential to be able to send and receive data.) So if you don’t have one already, you’ll need to set up an endpoint whose role it is to receive and handle this request. With the connected app set up, it's handy to get an idea of how the data flow works. To start, your user is directed to a Saleforce.com authorization endpoint. There, they log in and approve access for your app to access their data. After a successful authorization, Salesforce sends a response with an Access token and Refresh token. The Access token is to be passed in the header of all API requests for data. This token has an expiration date and will always expire. By default, the Connected Apps have an access token with an expiry of 15 minutes (inline with the sessions settings within your Salesforce settings). 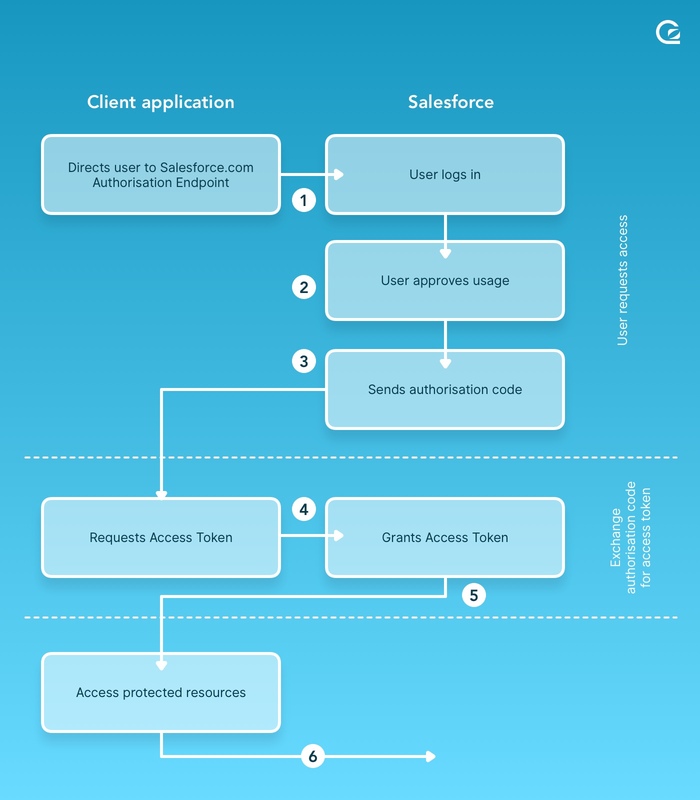 To make the initial authorization request for a user to grant your app access to their data (this is where your user is initially directed to a Saleforce.com authorization endpoint and logs in) you’d make the following request. The client_id in the below call will be your consumer ID from the connected app. The redirect_uri will be the Callback URL.